Using Find & Replace in PowerPoint you can easily replace any occurrence of text. Either the find tool or Find & Replace feature in PowerPoint can be very helpful for any presenter and presentation designer. It can be used to replace content on each slide but also to replace titles, content in footer or header as well as master slide. The tool can be used in many different scenarios. For example, if you as a presenter receives a presentation from the designer containing typos or placeholders, you can easily replace any occurrence of text and fix the presentation without manually editing each slide. 1. Click CTRL-F or look for the Editing section, at the right end of the Home tab of the PowerPoint Ribbon. Here you will see both the Find and Replace tools. 2. In the Find dialog, enter the text you’d like to find and then click Find Next. If there are more than one occurrence of text, you can continue pressing Find Next to move to the next slide containing the text. The Find tool offers a quick way to locate a specific text string anywhere in your PowerPoint presentation. If you require to replace a text (not just finding it) then you can use the Find & Replace tool. This tool is located in the Editing section of the Home menu just below the Find tool. Replacing text in a PowerPoint presentation can be useful if you need to edit the presenter’s name on each slide footer or change the date of the presentation globally if an older presentation date is shown in the footer of the slides. 1. Look for the Editing section, at the right end of the Home tab of the PowerPoint Ribbon. Click Replace button. 2. Under Find what textbox, enter the text you’d like to find. 3. Under Replace with textbox, enter the new text to replace the old one. 4. Click Replace All to replace all the occurrences of the text within the whole presentation. Tip. If you want to preview your changes first, click Find Next multiple times until you can make sure the text replace operation will run smoothly. You can also replace one occurrence by clicking Replace button. If you want to replace certain text matching a particular case, then you can check the Match case option in the dialog. This will replace only occurrences that matches the case in the Find what text. Additionally, if you want to replace whole words and avoid replacing substrings then you can check Find whole words only. 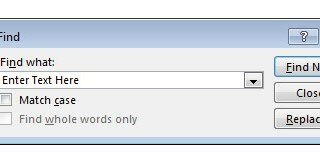 By checking this option, PowerPoint replace tool will only replace text if it is part of the whole word.